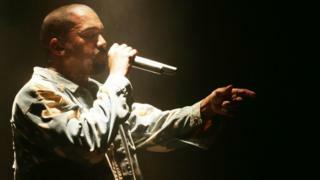 Rapper Kanye West has declared he wants to work with Ikea on a new range of furniture. "I have to work with Ikea - make furniture for interior design, for architecture," he told BBC Radio 1. He said students would be particularly keen for him to create "a minimalist apartment inside of a college dorm". "Yo Ikea, allow Kanye to create, allow him to make this thing because you know what, I want a bed that he makes, I want a chair that he makes." West was pictured visiting Ikea's head office in Almhult, south Sweden, earlier this year. He has previously collaborated with British fashion designer Katie Eary who has, in turn, created a series of textiles and tableware for Ikea. The company has so far declined to comment on a possible tie-in with West, who has a sideline designing clothes and shoes. Its ethos of providing affordable goods would chime with West's ambition to make his own products more affordable. The star's interview with Annie Mac also covered his headline set at the 2015 Glastonbury festival. He said a musical error at the beginning made him forget his lyrics, with knock-on effects for the rest of the set. "It was incredible. I started off the show and I completely messed up the music. And me, as you can imagine by this phone call, I'm a bit of a perfectionist. So it really put me into a slightly depressed state and it put me back in the position of when I was in high school and I got fired from my job. "I don't usually get nervous, I prepare, I get fully prepared. When that music messed up in the beginning it tapped into my nerves and when you're nervous or vulnerable something special and something different can happen." And he discussed his political ambitions, after previously declaring he would run for president in 2020. "When I talk about the idea of being president, I'm not saying I have any political views," said the 39-year-old. "I just have a view on humanity, on people, on the truth. "We are numb, we're numb to 500 kids getting killed in Chicago a year, we're numb to the fact that it was seven police shootings in the beginning of July. "If there is anything that I can do with my time and my day, to somehow make a difference while I'm alive I'm going to try to do it." You can hear the full interview from 19:00 BST on Annie Mac's Radio 1 show.